So with only 24 hours left to go before I needed to leave home for the horrendous 4 1/2 hour drive down to RNAS Culdrose I was finally given permission to flying with 771 Squadron. The idea was to spend 24 hours with an on duty SAR crew and document everything from a SART sortie, shout outs and 'downtime'. After signing in at the front gate of Culdrose and meeting Lieutenant Jonathan Duke he takes me over to 771 Squadrons crew room for the morning briefing, this includes everything from the Met, information about the 'cab', what our SART sortie would involve and diversion airfields amongst other things. In for the morning briefing prior to our SART sortie. After the briefing it was then left to Jonathan to show me the emergency exits in the Sea King Mk5 and also the correct brace position in case of the worst case scenario of ditching in the sea. At 1000L I was about to get my first taste of flight in a rotary aircraft and also a military aircraft, one thing I had never considered is how much the kit can really weigh you down. On top of the flight suit I had a life support jacket, my harness for winching and a helmet, all essential pieces of kit but when you throw a camera bag into the mix it doesn't half get hot. After the pre flight checks we taxied out onto the runway at RNAS Culdrose and ascended to 2000ft, our first port of call was with a boat of the coast of Cornwall to conduct winch training. A matter of minutes later and the pilots, Commander Martin Shepherd who is the CO of 771 and Lieutenant Jonathan Duke had found the boat in question and began to position for winching. First to be winched down on to the boat was Petty Officer Aircrewman Adam Mayes, once down 'Maisy' unhooked the line. Lieutenant Commander 'Grossy' Daw then calls me over, checks my hardness, hooks me up and then begins the winching process. With 'Maisy' giving commands to 'Grossy' on my position I finally touch down on the top of boat. 771 NAS Sea King Mk5 during winch training. 'Grossy' then lowers the stretcher down to 'Maisy' on the deck of the boat, it was fantastic seeing all four crew working together seamlessly. Once the stretcher was down on the deck 'Maisy' hooks back up to the winch line and gets winched back up, whilst this is happening the boat has to reposition do. The crew hold off for a few minutes before approaching the rear of the boat again to winch down 'Maisy' to hook me back up. You can see from the image how much spray is kicked up from the downwash/rotorwash. Spray from the sea is kicked up onto the lens. Once the winching ops were completed it was then another short flight over to Halzephron where we 'landed on' in a field near to a site that would be used as a Pinnacle landing on the cliffs. After jumping out of the cab with 'Grossy' and positioning ourselves in a good viewing spot Commander Martin Shepherd and Lieutenant Jonathan Duke began their descent for the cliff with 'Masiy' guiding them down. A true testament to how all the crew play a vital part in manoeuvres such as this. 'Maisy' guides the crew down from the back as he hangs out of the door of the Sea king Mk5 during a pinnacle landing. The hero shot as 'Grossy' poses for the camera with a 771 NAS Sea King Mk5 hovering behind. What had seemed like only a matter of minutes with winching ops, pinnacle landings and a cliff walk we were on our way back to the airfield for 20 minutes of auto rotations. The whole experience felt quite surreal, being able to go out on a SART sortie and be part of the training that plays such a vital part in their job was truly an honour. With brews passed out the debriefing began with the crew, it was fantastic hearing the crew analyse everything we had done throughout the sortie. A matter of minutes after the debriefing the phone rang for their first and only shout of the day. 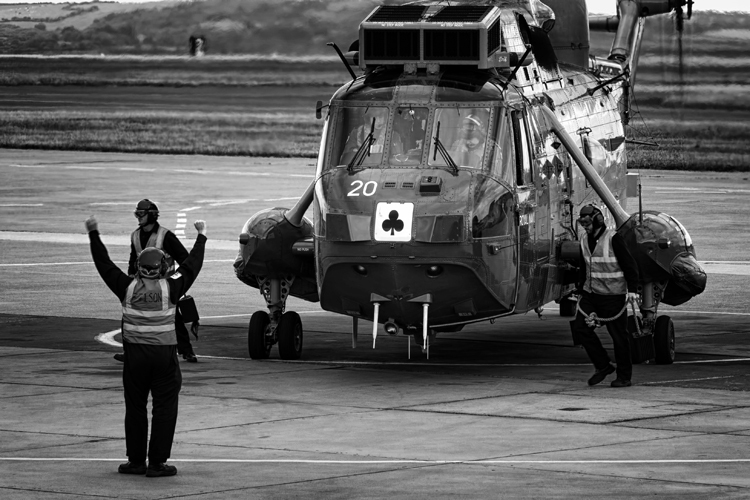 Ground crew remove the chocks from the wheels of the Sea King Mk5. 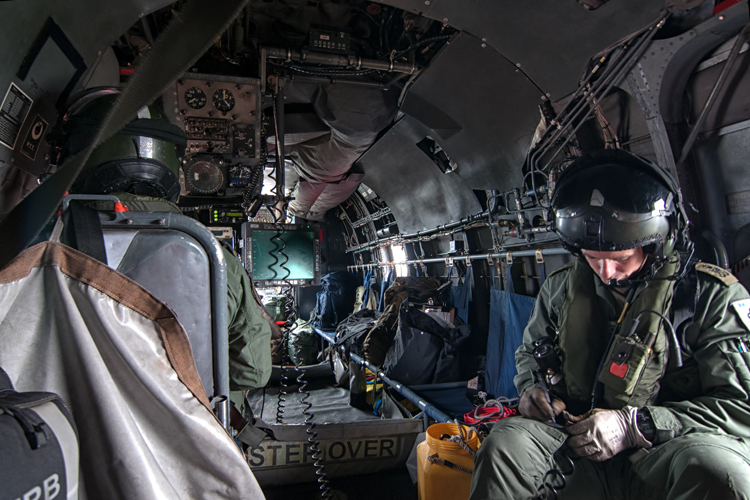 In what seems like a matter of minutes the crew had quickly scoped out the area on the map in the ops room and were in the Sea King Mk5 with rotors running. It really just shows how efficient everything is, this of course comes from training like our SART sortie earlier in the day and experience. After rescuing an injured female cyclist and flying her to hospital they return for a debriefing with two paramedics sitting in as well. After the first and only shout out we spent most of our time in the crew room watching TV, I can see how it could sometimes get a little monotonous if you go a day or two with no shouts. After polishing off our food on the balcony outside 771 Squadrons crew room we made our way to the briefing room for the night met brief, basically in the morning I'd be finding out what the Culdrose clag looked like. It was then time to settle down for the night shift, with Skyfall on the TV and the distant noise of a Sea King starting up it was all a little surreal, I mean its nothing something you experience everyday. I wanted to get some low light shots of the next SART sortie that was due out so I made my way out on to the balcony again and watched the ground crew scurrying around making sure everything was ok. With the crew inside performing checks they started their start up procedure. Long exposure of the 771 NAS Sea King Mk5 as the crew prepare to taxi out. I joined Lieutenant Jonathan Duke for a walk around of the cab whilst he made sure it was 'cocked' which ensures they encounter no nasty surprise during a quick start up in case of a shout. So with Skyfall finished and with no shouts having come in we parted company for the night and hit the hay. And sadly that was it, my time with 771 Squadron was over. The thick fog/sea mist that had rolled in over night cancelled all plans for the day of getting some more images of the take over crew training on the cliffs on their morning SART sortie. It was a fantastic experience to spend 24 hours with these guys, they provide a service which so many people are thankful for and it will be interesting in 2016 to see how the Bristow will take on the challenge. I'm just thankful I had the chance to spend time with the very welcoming guys and girls at Culdrose that really could not have been more helpful. Although I'm sure many would wince at the mention of it, but in my opinion and I'm sure many others they're all heroes in my opinion. Putting ones self in possible danger to save another life, albeit not the dangers you would find in a war zone but dangers nonetheless. I would like to express my utmost thanks to everyone who made me feel so welcome during my time there.